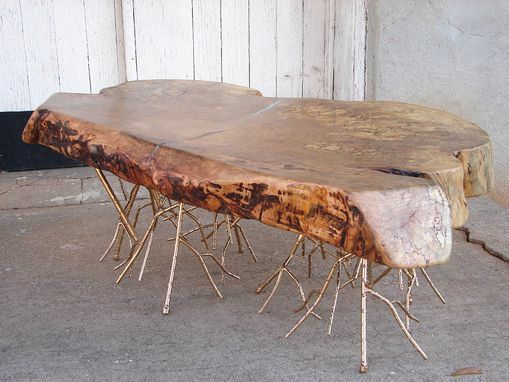 Here is a stunning coffee table which is custom-made and quite impressive in person. The top is composed of a massive slab of beautiful spalted maple carrying a wonderful mix of black spalting and natural figure of the wood. 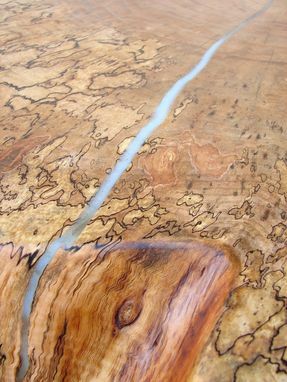 A crack formed near the center of the piece and was filled with turquoise resin which resembles a stream that flows directly over the side of the top. 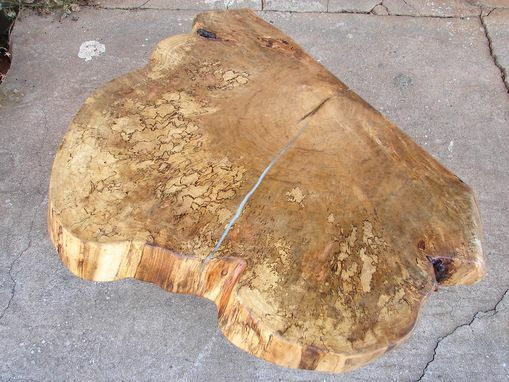 This slab is 4" thick and the large live edge carries amazing grain and figure as well. The top has been sanded up to 400 grit paper and finished with natural oils and wax leaving a flat surface which is as smooth as ice. 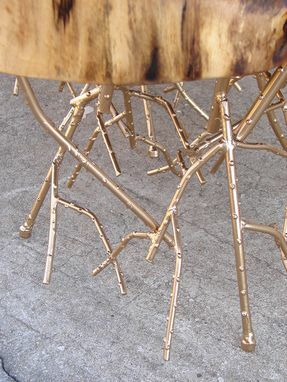 The base is comprised of welded steel rod with a gold finish and it gives the appearance of numerous tree limbs sprouting in all directions while anchoring this monumental table to the floor. 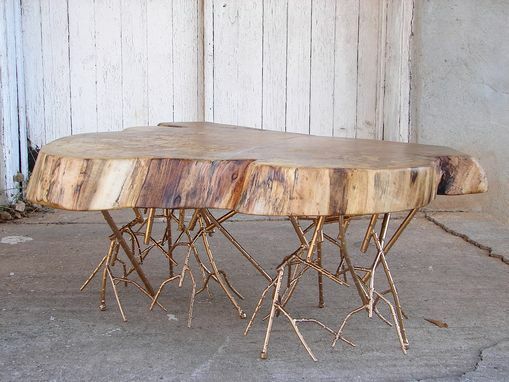 This table could work with many decorating styles from mid century modern to cabin rustic chic to contemporary. It is sure to make a fine addition to any home or office! 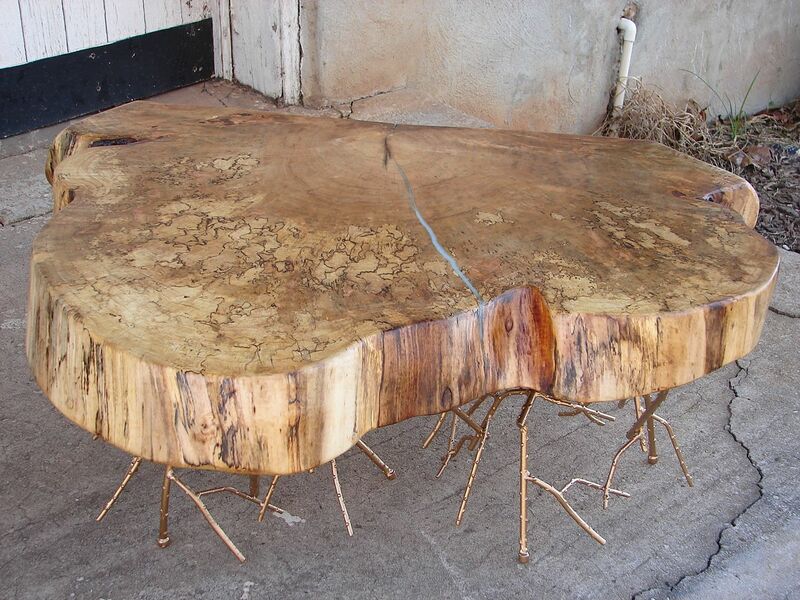 The table is in excellent condition and measures 40"/31" and 16.5" tall, overall. The table weighs roughly 75 pounds so shipping will be via a freight company of your choosing or you may pick up in person for free. freight shipping will cost around $300.00+ depending on your zip code. Local delivery to the metro Atlanta area will be $50.00.